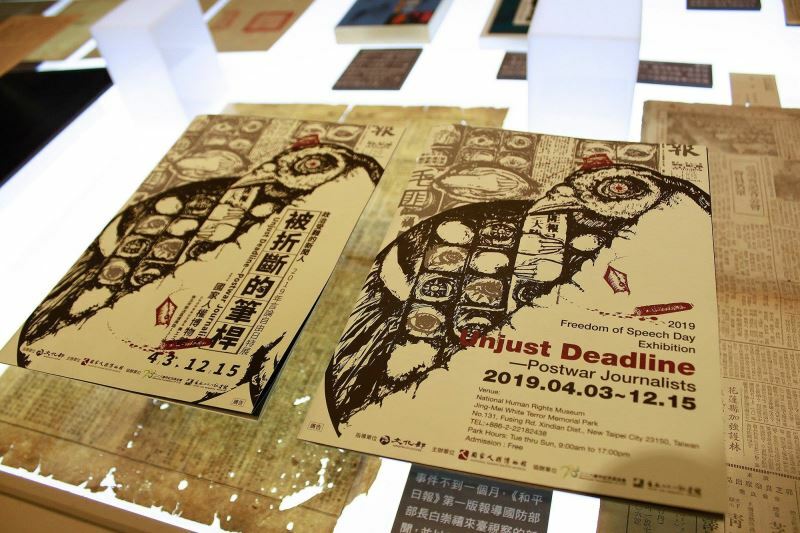 From April 3 through Dec. 15, the Jing-Mei White Terror Memorial Park will play host to the National Human Rights Museum's special exhibition in honor of Freedom of Speech Day 2019: "Unjust Deadline—Postwar Journalists." 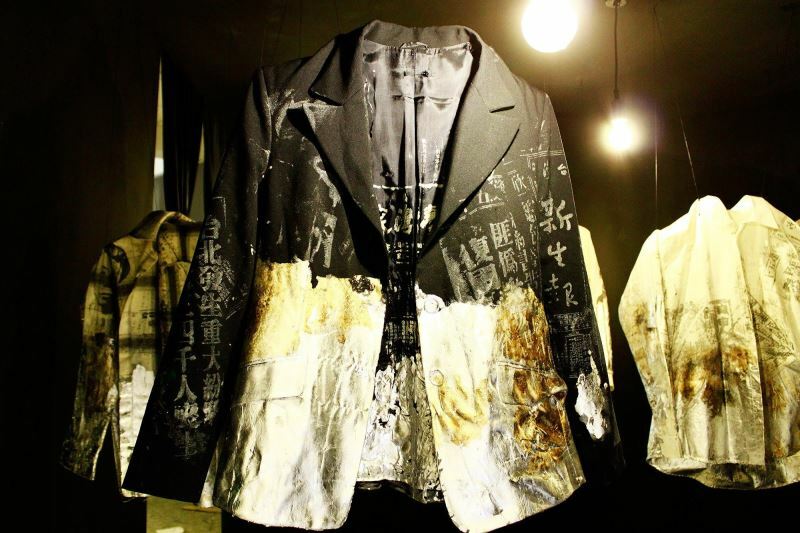 The New Taipei City exhibition will also be accompanied by film screenings and seminars. 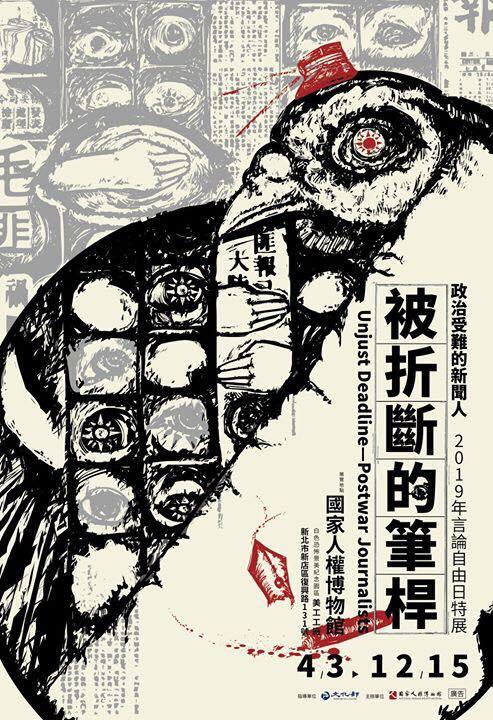 "Unjust Deadline" covers the political persecution of the news media from the February 28 Incident of 1947 through the White Terror period, using the experiences of the journalists who suffered to look at the measures of oppression and restraint the authorities employed during the period of authoritarian rule and reflect on the value of a truly free media as the guardian of freedom of speech and cornerstone of human rights. 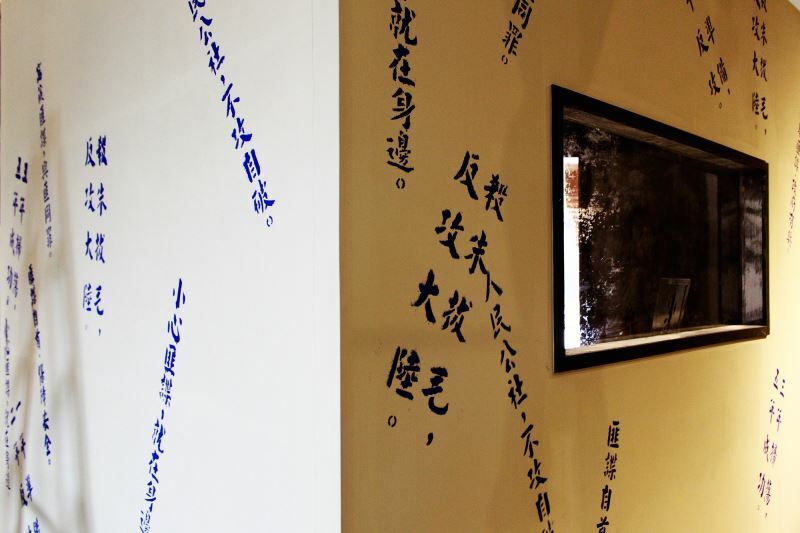 The exhibition features Huang Chih-cheng's (黃至正) "Editor's Desk Imprisoned at Garrison Command" installation and Chen Yun-ju's (陳韻如) "Silenced Group Portrait" interactive installation. 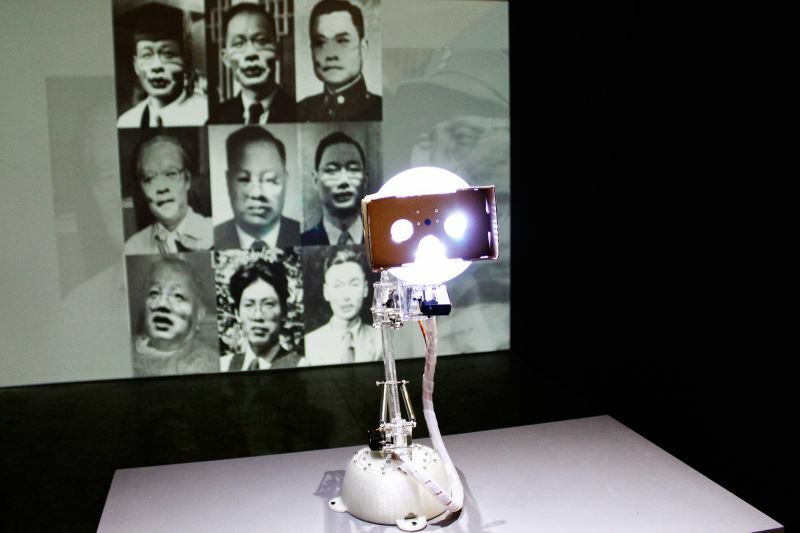 These, combined with reconstructed interrogation room scenes; "patriotic" anti-communist radio propaganda from the authoritarian era; and anti-Communist, anti-Soviet slogans all around, visitors will get a visceral sense of the oppressive, unfree air of a time when voices were silenced and the threat of surveillance was constant. 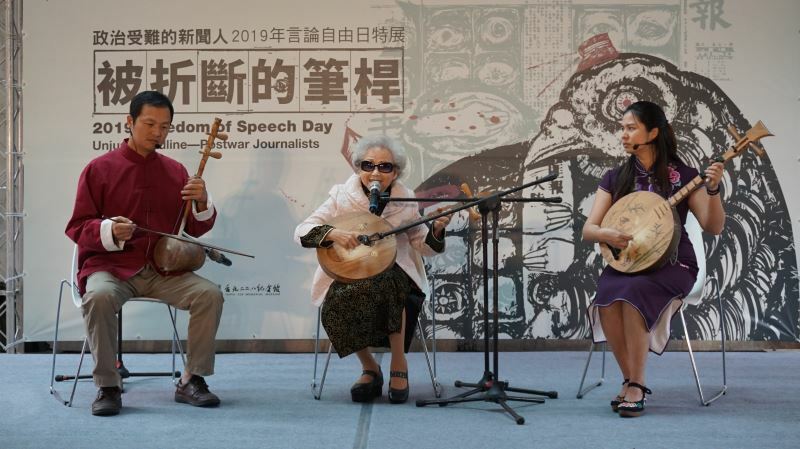 Deputy Minister of Culture Celest Hsiao-ching Ting (丁曉菁) commented that journalism is the cornerstone of a democratic polity and that the role of the Fourth Estate is essential. The structures and challenges of journalism under authoritarian rule were very different from those of the Internet age, and the oppression they faced was far beyond anything seen today. They fought for journalistic values, and their commitment is an inspiration to us all, she added. 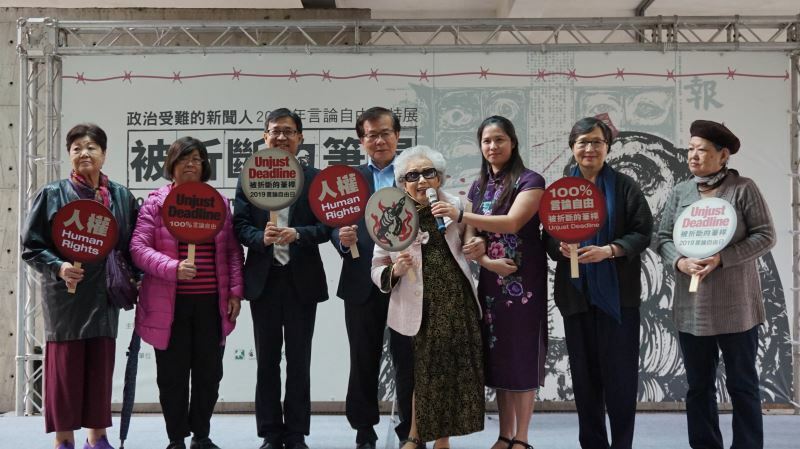 Chen Chun-hung (陳俊宏), director of the National Human Rights Museum, said that from the cautionary tales of how journalists once suffered political persecution, one can witness how far freedom of speech and freedom of the press have come in Taiwan, and how hard the journey has been. In this "post-truth" era of social media, where emotion and belief can be more of an influence on public opinion than objective facts, the traditional gatekeeping role of journalism is under attack, and how those in the news business are to respond to this challenge is a serious issue, he stated. Through this exhibition, one will also see how many journalists gave their lives for their ideals. 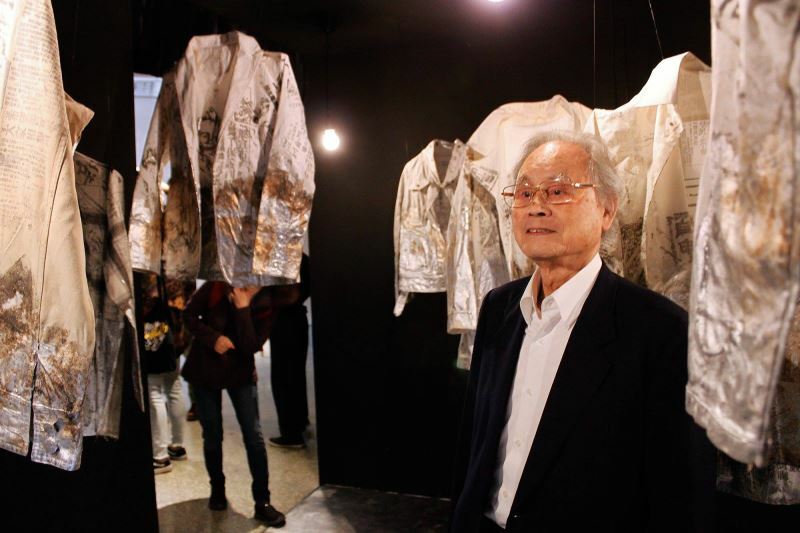 To commemorate the 30th anniversary of pro-democracy pioneer Cheng Nan-jung's martyrdom﻿, the museum invites everyone to reflect on what freedom of speech meant to him, in hope that more members of Taiwan society will focus on the core values of freedom of speech and freedom of the press. According to "Outline of Taiwan Take-Over Plan," the Japanese language was forbidden from use in all official documents, textbooks, and newspapers. All Japanese versions of news and magazines were strictly removed after October 25. At the February 28 Incident, many Taiwanese elites and journalists were arrested. 18 media outlets were suspended. "National Mobilization Law" was announced on July 4, bestowing the government with full power to restrict, stop, or manage the establishment of news agencies and their contents. Speech, publishing, writing, communication, assembly, and association were strictly controlled. "Temporary Provisions Effective During the Period of National Mobilization for Suppression of the Communist Rebellion" was announced on May 9. This expanded the power of the president and the constitutional regulations on urgent, disciplinary action were suspended. The Governor of Taiwan Provincial Government and Commander of Taiwan Garrison Command Chen Cheng announced "Taiwan's Martial Law" on May 19. Martial law became effective on May 20, 1949 and was terminated after 38 years on July 15, 1987. Martial law strictly prohibited all kinds of assemblies and parades, student and labor strikes, and demagoguery. Serious offenses could incur the death penalty. The Martial Law period is also known as the "White Terror Era." According to a report from Judicial Yuan, around 60 to 70 thousand political cases and 200 thousand people went through military trial, and at least 140 thousand of them were innocent victims. "Statute of Rebellion Punishment" was announced on June 21, expanding the definition of crime to suppress political dissidents. "Counterintelligence Investigation Act during the Period of National Mobilization" was announced in June. "Paper Saving Act during War" was implemented on Dec. 1 to restrict the number of pages a newspaper was allowed to publish. In 1951, the government announced "Certificate Limitation Policy" to limit the registration of new newspaper agencies, and printing factories were restricted to only one region. The Legislative Yuan adopted the amendment of "Publication Act" on March 25, which implemented the pre-registration of publications and prohibits contents that violated or incited others to commit "Offenses against internal and external security, Offenses of interference with public functions, Offenses of interference with voting, Offenses of interference with public order, Offenses against religion, graves and corpses, or Offenses against sexual morality." The government announced "Regulations Governing Newspapers, Magazines, and Books during the Period of Martial Law in Taiwan Province" on July 27, which prohibited all publications from leaking classified national security data, publicizing communist propaganda, slandering heads of the nation, violating anti-communism and anti-Russia national policies, causing the loss of morale, harming social security, and instigating anti-government acts, among many other restraints. 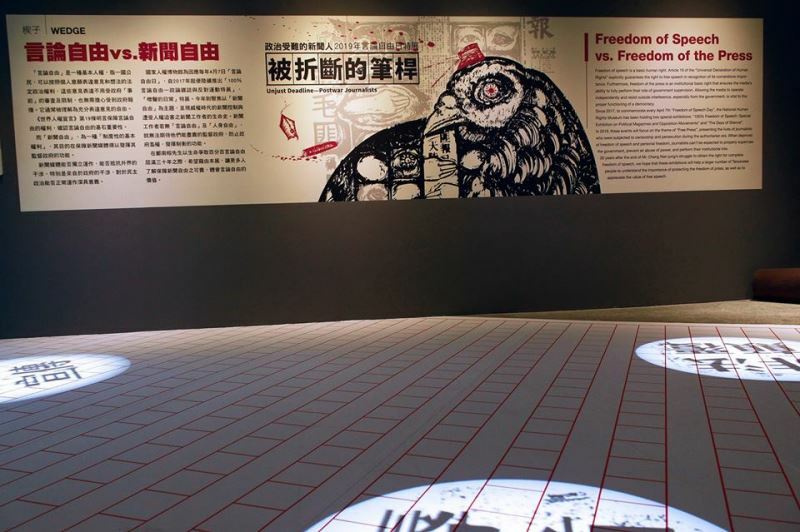 The fifth amendment of "Publication Act" was passed on June 28 to regulate the punishment of revoking a publisher's official authorization for "turbulent speech" about sedition and offenses against external security. The International Federation of Journalists took this amendment as hard evidence of no freedom of press in Taiwan. The Taiwan Garrison Command announced "Regulations on Publication during the Period of Martial Law." Regulations forbidding all kinds of publications from China was added later. The Executive Yuan amended "Regulations Governing Newspapers, Magazines, and Books during the Period of Martial Law in Taiwan Province" on April 23 into "Regulations Governing Publications during the Period of Martial Law in Taiwan Region." Additional amendments banned all books, translated literature, and publications from the Communist Rebellion. Martial law was lifted on July 15. Restrictions on newspapers terminated on Jan. 1. "Temporary Provisions Effective during the Period of National Mobilization for Suppression of the Communist Rebellion" terminated on May 1. "Betrayers Punishment Act" terminated on May 22. "Counterintelligence Investigation Act during the Period of National Mobilization" terminated on May 23. Amendment to Article 100 of the "Criminal Law" announced on May 16. Only "Insurgencies by coercion of violence and threat" are now considered sedition. Taiwan Garrison Command dismissed on August 1. "Publication Act" terminated on Jan. 13. Visitors Today:57. All Time Visitors:1,229,864.